Various shoes manufacturers focus purely on their product and not on the type of packaging that contains them. Packaging can do wonders with the positive impact on consumers. Some shoes packaging force customers to keep them safe for its usability. Such as cross shoe (a cyclocross-specific shoe) launched by collaboration of Giro and Ralpha are sold in a packaging that consists space to hold beer and fries. In developed countries, 44.3% consumers are attracted to packaging while purchasing shoes. Further, shoe packaging is also important for its transportation, in order to protect them. As per DHL express, a logistic company, shoe boxes are not resilient enough to sufficiently protect shoes in an Express network, thus it must be over packed as per their size and weight. Shoe packaging designers play major role in designing of package in order to attract the targeted consumers. High end consumers tend to incline towards innovative packaging, whereas masses prefer durable shoe packaging. Goldstein Research analyst forecast that the global shoe packaging market size is set to reach USD 8.12 billion by 2025, growing at a CAGR of 6.1% over the forecast period. Supply of raw materials, innovative shoe packaging, demand for different type of shoes, trend of using eco-friendly raw material in packaging, are some of the factors augmenting the growth of global shoe packaging market. The report covers the present ground scenario and the future growth prospects of the shoe packaging market for 2017-2025 along with the global sales and global revenue of shoe packaging. We calculated the market size and revenue share on the basis of revenue generated from major players across the globe. We have forecast the market on the basis of manufacturers, suppliers and distributors, raw material suppliers, sales of shoes. On the basis of product type, corrugated boxes accounted for largest market share of 38.9% in 2017 of global shoe packaging market. Corrugated boxes are most commonly used for shoe packaging, from local shoe manufacturers to global players, for its low cost of manufacturing and single packaging pattern which is suitable for most shoe types. Further, reusable shoe packaging is expected to grow at a CAGR of 5.9% over the forecast period on the back of its trending designs that are made for the purpose of reusability it in different ways, for example Rapha cross shoe packaging that is designed to keep fries and beer in it. Shoe packaging market outlook 2017-2025, has been prepared based on an in-depth market analysis from industry experts. 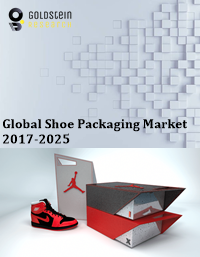 The report covers the competitive landscape and current position of major players in the shoe packaging market. The report also includes porter’s five force model, SWOT analysis, company profiling, business strategies of market players and their business models. Global shoe packaging market report also recognizes value chain analysis to understand the cost differentiation to provide competitive advantage to the existing and new entry players. Major shoe packaging players focus is shifting towards sustainable packaging. Thus it has become worldwide trend of using bio-based raw material in packaging. Such as Matadog Design founder, Andreas Kioroglou has developed more sustainable, cost effective and innovative design shoe packaging solution, Viupax as compared to traditional shoe boxes. Packaging is considered as a part of advertisement of any product. The demand for light weight packaging and rising customers for the attractiveness towards innovative packaging is driving the growth of global shoe packaging market. The major challenge for the shoe packaging companies is to tackle with the recyclability of the huge amount of waste generated. The different materials used are difficult to segregate for its recycling, as each material requires different recycling process, and most often they are rejecting for recycling. Based on geography, Asia-Pacific accounted largest market share of 38.3% in 2017 of the global shoe packaging market. APAC region has the largest packaging industry, growing at a CAGR of 5.3% from 2015-2017. Further, Asia-Pacific region has largest shoe manufacturing market, with China, India, Vietnam, Indonesia and Thailand among the top shoe manufacturing countries, which is instigating the growth of shoe packaging market. Latin America is opportunistic market for the growth of shoe packaging market. In 2017, Brazil alone accounted for 895 million pair of shoes production and 5th largest country in global packaging market, providing opportunities for shoe packaging. Global Shoe packaging market report comprises of the following companies as the key players in the Shoe packaging market: Sneakerbox Co., Packman Packaging Private Limited, Samrat Box Mfg. Co. Pvt. Ltd., Royal Packers, Elevated Packaging, Precious Packaging, Cross Country Box Company, Zhuhai ZhuoYa packing product co., Ltd.
What is the revenue of Shoe packaging market in 2016-17 and what would be the expected demand over the forecasted period?